A common request is to display year over year comparisons, and there are a number of ways of accomplishing that. What if your users do not want to see any of the future months, or even possibly this month, since it is not yet complete? This actually turns out to be fairly easy – you just need a few pieces to make it happen. Something on the screen that lets the end user control things – I used a slider in this case. a calculated dimension in your chart. Step 1 – create a variable. (Settings / Variable Overview / Add). I called mine vCurrentMonth, and set it in the load script to be whatever the current month is based on today’s date. 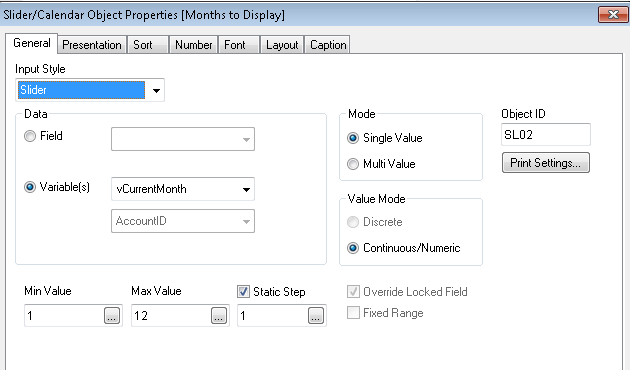 I load a master calendar where I have values set for every date as to MonthOnly, ReportingMonth, Year, and a variety of other flags. 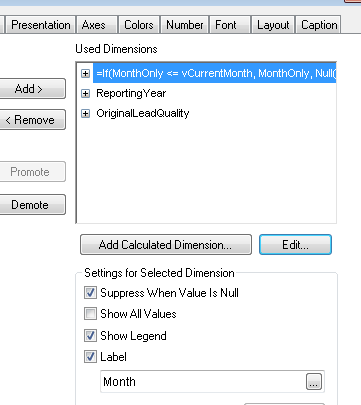 The reporting year dimension is exposed to the user as a list box, so they can display the year(s) of interest. The one issue that people may have will come down to preference – this will fill the chart with the number of months that it needs to display. If you want to show the subsequent months as blank spaces, you will probably want to implement this via set analysis in the expression instead of a calculated dimension.